A Chat with Jared Padalecki at TorCon – On Sam, Season 8 and That Gorgeous Hair! We were lucky to have the chance to chat for a bit with Jared Padalecki at the Toronto Con, and also to get a report from Jared’s VIP meet and greet from passionate Jared!girl Lynda. Fans kicked off Jared’s meet and greet with a question that immediately put him in a great mood – can we see a photo of Thomas? Jared said sure, and pulled out his iPhone, saying that Gen sends him a photo of the baby every morning, so he never has to go a day without seeing his son. Luckily, Jared had plenty of photos of Thomas to share. Fan: So what else is going on? What’s new? Jared said that he’d been approached by actor Justin Hartley and asked to appear on his new reality tv show that explores the exciting lives of the rich and famous. Jared declined. Jared: My life is too boring! I go to work, come home, play with the kid, play with the dogs, study my script, that’s it. Fans: Sounds plenty interesting to us…. Jared confided that he’d never really been into the Hollywood scene of premieres and red carpets, and now that he’s a dad, even less. Fans nodded their approval. A fan then brought up the topic that is currently taking over many of our twitter feeds – Jared’s hair. Fan: So your hair is sort of wavy and long now – is it naturally curly? Jared: Yes, actually it is. On the first season of Supernatural, they straightened it for Sam. But every time I pulled my shirt over my head, it got all messed up and looked terrible. So I eventually convinced them to stop. When talk turned to Season 8, Jared confided that he’d been worried about fan reaction to Sam not looking for Dean after his disappearance at the end of Season 7. Jared: You guys have to remember, every other time, I’ve had a clue where Jensen is – I mean, where Dean is. I knew he was in hell or something. Sam has always had a way of trying to find him. But this time, I had no idea – he just disappeared and I had no handle on it to even look for him. Also in the past when Dean disappeared, Sam had some support – he had Bobby, or he had someone – but this time there was no one, everyone was gone. It was truly a “fresh start” for Sam. And Sam had to make a new life for himself, and he did — there’s even the Dog. Like Jensen, Jared also talked about the conflict coming up between the brothers, over Sam’s fresh start and over Dean’s new relationship with Benny the vampire. Fans: *are biting nails* Hang on for a wild ride this season! With a table full of passionate fans, talk turned to how many more seasons of Supernatural we can count on, especially since the boys shared that Mark Pedowicz, the newish head of the CW, had come up to Vancouver and taken the guys out to dinner recently. That bodes well, right? Jared confirmed that yes, it does. Jared: It’s gonna go ten years. Fans (are greedy): And after that? Jared: I don’t know. You can’t ask me about it now, I’d have to consider the circumstances at that time. I’ve had a lot of good advisors throughout my career, there have been things I was offered that I haven’t accepted. Jared: Like the movie American Pie. Jared: And maybe I could’ve gotten famous overnight, but it wasn’t the direction I wanted my career to go. There’s nothing wrong with the film and those who did do it, but it wasn’t the right direction for me. We chatted with Jared later in the day about our book that was published earlier this year, Fandom At The Crossroads. Since Jared, Jensen, Misha and Jim all contributed extensive interviews to the book, we gave each of them a copy – but we honestly didn’t expect any of them to actually read it. When we gave a copy to Jensen, we thanked him for his thoughtful contributions. Jensen: (grinning) I’m pretty sure you did all the work! Totally not true, we pointed out – after all, some of the interviews they gave us took place well after midnight after a long day of shooting! Then Jensen made us cry by insisting that we autograph the book. For *him*. Jensen: After all, I’ve given you tons of autographs over the years, fair is fair….. Um, are you okay? Us: Um, fine. Something in our eyes…. Then Jared made us get all emotional too at Toronto Con. Damn these boys for being so sweet! Lynn: So we heard you read some of our book? Jared: (emphatically) Some?! I read it ALL, every bit of it! Didn’t Misha tell you? I told him to tell you! Kathy: Um, yeah, he did… but we thought he was probably exaggerating…. Jared: No! I read all of it – and I loved it. Us: (gaping unattractively) You did?? Jared: I did. It was really well written. And it really helped me understand a lot of things better. Even here, at the conventions. Us: (still gaping) It did?? Jared: (nodding) So am I still the only one (of the cast) who’s read all of it? Kathy: Jensen read some, Misha’s been kinda busy, and Jim Beaver read about 2/3 of it last we checked (avid reader that he is, Jim read that much the first day we gave it to him). 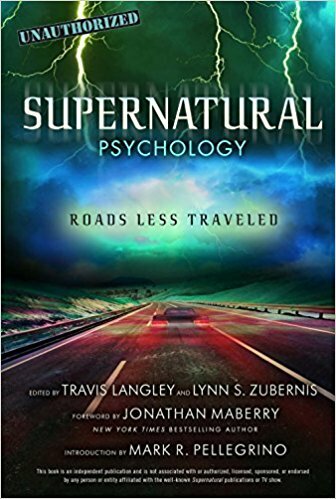 Kathy: (finally recovering some composure) In all seriousness, we really want to thank you, you contributed so much to this book, and it’s done well enough that we have two more books on Supernatural coming out. Jared: And I’ll read those too! Um, are you okay? Us: Oh sure, fine. We just keep getting something in our eyes…. You’ll have to forgive us for being so emotional – it’s just that these guys are sometimes too awesome for words. We had a great time at TorCon and were thrilled to catch up a bit with Jared, Richard Speight, Matt Cohen, Chad Lindberg, and Misha Collins. More from those chats later – right now, we need to find some tissues. “Its gonna go ten years.” Best. News. EVER! The dimples. The dimples just kill me. And the hair too. And especially the fact that Jared’s such a sweetheart – a down to earth and thoughtful guy. Um, yeah, we still seem to be having some problem with that dust in the eyes thing. LOL. Let’s hope Jared’s belief that Show will go ten years translates to an actual network pickup — fingers crossed! And yes, such a thoughtful and intelligent guy, truly. Lovely! And it was a fantastic weekend! I find it really interesting how Jared sounds almost like he feels that he has to justify Sam’s decision to not look for Dean. It shouldn’t be like that. I feel like the writers really messed up with that storyline and it is such a shame. Sam has had no leads in the past, and he still did not give up on this brother. In fact in Mystery Spot, Sam decided to go it alone to find Dean. I hate that Jared is nervous about fan reaction, but sadly he should be because fan reaction to Sam not looking has been anything but positive. I feel like the show has been drifting from the brother relationship focus for awhile. If the writers seriously want the show to go to 10 seasons, I really think the writers need to bring the emotional focus and heart of SPN back to the brothers. 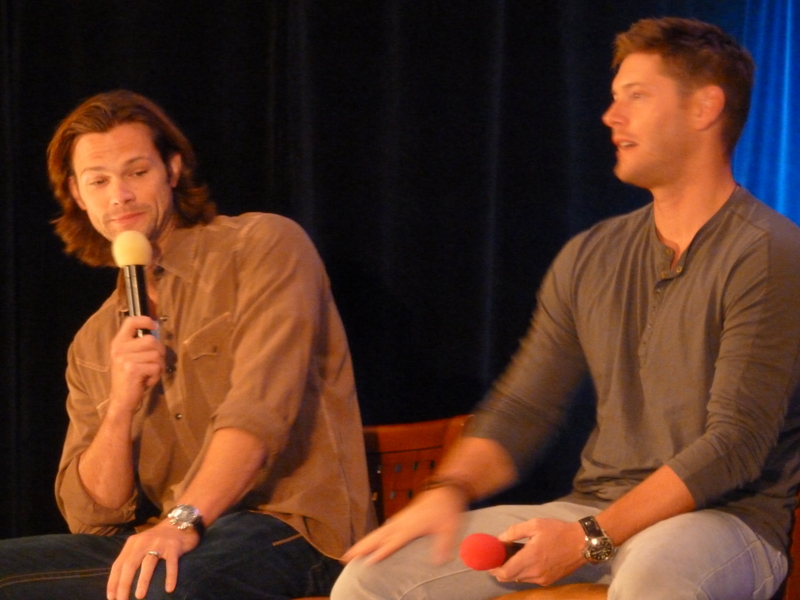 Also loved Jared’s “Jensen” slip over “Dean” – too funny! The brother relationship is definitely what got us hooked on the Show, so fingers crossed that it gets back to being the focus – it’s the emotional core of the Show that everything else revolves around. I do think it’s good to explore rifts and anger and hurt between them, because that’s as inevitable in a close relationship as the love is, but at the end of the day I think we’re all looking for that close bond between the brothers to pull us back in. We loved that slip too — after eight seasons, a little character bleed is inevitable! Awesome. Thanks for always sharing everything. I have to say I am soooo jealous you get to talk to them at every convention. So cool! When we’re lucky enough to get actual interviews, we’re ridiculously grateful – but we have to pay for the meet & greets like everyone else, so alas, we don’t get to talk to them as often as we wish. We’re grateful for what we do get to do, so try to share everything we can — we’re grateful when other fans do the same when we’re not able to be there! Lynda, thank you for the report! So good to hear from Jared. He is such an interesting and warm hearted man. As a fan of the show since the pilot, I’m willing to wait and see how Sam’s storyline progresses without rushing to judgment, it is too bad that others won’t do the same. This was GREAT!! Thank you so much. I love how Jared is such a reader..
Beautiful! Thank you for the write-up of your time with Jared. He’s such a wonderful person! Glad to hear 10 seasons is looking more and more likely. 🙂 These guys are such a brilliant and good part of my life. That’s a great way to put it – these guys are a brilliant and good part of many of our lives. And we wouldn’t have it any other way! It must be amazing to have one of your interviewees read all of your book. I mean, it must be amazing to HAVE a book in the first place, but knowing that the people you wrote it about (in a way) liked it enough to read it through… that would make me all tingly inside. Great interview and I hope you managed to get that pesky dust *wink, wink* out of your eyes! It also really bugs me that Jared seems to have to justify what Sam’s actions were. He’s an actor he simply does what the writers/producers/directors tell him too. Do I especially like the fact that Sam didn’t seem to search for Dean, no. But he’s an actor and some in the fandom just kind of forget . . . it’s a show. Chill out and just enjoy the ride. It’s super “fan”tastic that Jared has read your book. So cool. My heart hurts for Jared, thinking he has to justify Sam’s lack of looking for Dean and he gives the logical reason – he didn’t know where to look! But it really pains me that they could have had Sam use those very words when he was defending himself against Dean’s onslaught. One little line would have helped explain things and make Sam not look so bad in the eyes of some fans. Of course, a lot of those fans don’t like Sam anyway, so I doubt it would help after all ;-( But I do think Carver dropped the ball but not having Sam say that one little line – I” didn’t know where to look”. Instead he has Sam say nothing and look all guilty…sigh. And why do we have to wait til about episode 9 or 10 to find out more about Sam’s motives or reasons? This has happened in previous seasons (Ruby, etc.) and by that time the people have either forgotten or already made their minds up that he did a bad thing and there’s no excuse. It sounds like Show is going to prolong the angst a bit, but you’re right, if I were Sam, that’s what I would have said! Hopefully it won’t take TOO many episodes to lay out at least some of the explanation. These boys are so sweet. They just kill me. So happy for you!!! and 10 years!! and he read the book – oh, now I have something in my eyes too! Where can I find that book. Fandom At The Crossroads is on amazon.com — now in paperback! Hi, I can’t get it on Amazon. Well its listed but at $999! I love fandom, but not that much! Do you know if it’s a stock issue. Amazon UK has it for nearly £40 which also made me squeak a little! The Amazon listing was messed up yesterday ($999, lol!) but it seems okay today – the paperback is temporarily out of stock but should be stocked soon for $39.99. Or you can order directly from the publisher, who’s a UK publisher – at http://www.c-s-p.org. Pssst: for a 20% discount, login using “fandom” and password “fandom20%”. Let us know what you think when you read! Thanks for sharing your experience with us. I’m heading to VanCon next year and I’m really hoping to do the ‘meet and greet’ with Jared. He sounds like such a humble person and lots of fun to hang out with. You’re very welcome — hope you get to do a m & g at VanCon with Jared, he really is one of the nicest, most thoughtful guys we’ve ever met. And thank you so much for supporting our book(s)! Thank you so much for this interview. As someone who will never be able to afford to go to a convention let alone meet the boys, I rely on reports like this to keep me informed on what’s going on. I feel as if I am there with you which makes it very special. From listening to and watching Jared on you tube I am not surprised he took an interest in your book. He always seems really interest and grateful for anything the fans do to promote the show. He is a true role model and intelligent person. You are so lucky to have met him. Getting a little dirt in my eye myself now just thinking about this interview. Thank you once again and keep up the good work. Gonna try find your book now. You’re very welcome – and we do feel very lucky 🙂 Crossroads is for sale on amazon.com, or you can buy it direct from the publisher at http://www.c-s-p.org. For a 20% discount, login as “fandom” and use the password “fandom20%”. Happy reading!